How do you make an animal charity successful? There are literally thousands of organisations who through the dedication of their volunteers and supporters, strive to make a difference to improve the lives of animals, and the rules that govern the "human-animal relationship". Some organisations are more successful than others so it is helpful to look at what some of the successful organisations that are doing, as a model for moving forward. Paw Justice is one of those organisations. Paw Justice is a New Zealand organisation founded in 2009 by two friends who were, and still are, stuntmen in their "normal" lives. The two friends decided to take a stand against animal abuse – whether that abuse was the result of individuals being cruel to animals, or a consequence of procedures, policies or proposals of the central government or local authorities. Paw Justice has an exemplary history of success in a very broad range of activities. Have a look at their causes (the link is provided for you below). In addition to increasing social awareness, being the voice for animal justice, and funding a range of activities ranging from emergency surgeries through to children's education, Paw Justice also operates an enormous food bank and adoption service. There is more, but you can read about that on the link page provided. They are innovative too. 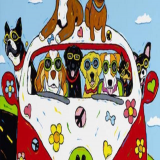 Amongst their range of fundraising activities, the latest addition is "Woofstock". A "dog festival" with "pets, love and music". Again, the links are provided for you below. New Zealanders get the chance to join in, and those people overseas who can't make it might nonetheless benefit themselves and the animals that they care for, by taking a look at some of the ideas of Paw Justice shown in their website, social marketing, activities, and of course their events like "Woofstock"